The MPIRICA Quality Score: What Is It? What is the MPIRICA Quality Score? The MPIRICA Quality Score rates how hospitals and surgeons have performed on specific procedures, on a scale of 100 (sub-optimal care) to 800 (superior care). Since it judges providers by the procedure, each provider may have multiple scores, based on the procedures they perform. That's important for both patients and payers to remember. A provider might be a world-class performer in one arena, yet produce poor outcomes in another. Unlike other provider ranking systems, The MPIRICA Quality Score will capture the discrepancy. This empowers decision makers with specific, valid, and actionable information to make good care choices. How is the MPIRICA Quality Score calculated? The MPIRICA Quality Score incorporates measures of quality that are most important to patients having surgery: mortality, major complications (exhibited by prolonged and risk-adjusted lengths of stay), readmissions, and ER visits. The data is evaluated from the time patients are admitted, through 90 days after they are discharged (for inpatient procedures). These figures offer historical insight into a surgeon’s performance. They’re the best metrics available to compare one provider’s outcomes with another’s. Using risk adjustment and analysis (more about this below), MPIRICA predicts the number of adverse outcomes expected from each surgeon. Then, it compares how providers actually perform against these predictions. If providers perform better than expected, they receive a higher MPIRICA Quality Score. If the outcomes are worse than expected, that drives their score down. More information can be found on our methodology page. What kinds of procedures does the MPIRICA Quality Score examine? The MPIRICA Quality Score measures performance on 28 surgical categories: 15 inpatient, 10 outpatient, and 3 that can be performed in either setting. A total of 864 possible procedures fall into these categories. Why should I trust the MPIRICA Quality Score? Although MPIRICA is a young company, the methodology behind The Quality Score is not. A team of doctors and statisticians at MPA Healthcare Solutions has developed and refined the science behind MPIRICA’s scoring system for more than two decades. MPIRICA’s calculations draw from the strongest dataset available in America – Medicare’s. The Quality Score analyzes millions of medical claims from over 100,000 surgeons and almost 5,000 hospitals across the country. Then it adjusts outcomes for patient risk (see more on that adjustment below), and rates providers on their performance. Because the MPIRICA Quality Score is based on a rigorous methodology to represent risk-adjusted outcomes, not subjective reviews, and because it uses the largest publicly available dataset, we believe it is the most comprehensive and robust score available in the industry. Members of the team behind the methodology have been published in numerous journals; a selected list related to medical quality analytics can be provided upon request to quality@mpirica.com. Why is the MPIRICA Quality Score important to patients, their families, their physicians, and their employers? For the average patient, healthcare data can be impenetrable. It’s not easy to access, and even harder to interpret. The MPIRICA Quality Score does this work for the patient, summarizing complex health-data into a simple three-digit number. That gives patients an intuitive tool to assess hospitals and surgeons at the procedure level. But businesses use the Quality Score, too. Payers can quickly see how providers in their network perform across various surgical procedures. This information, charted alongside cost and efficiency data, reveals surgeons and hospitals who provide the best value. Payers can use this information to create high-performance networks and inform their negotiation efforts. Self-insured employers and benefits consultants can also use the quality scores to identify excellent surgery providers and to create networks based on great outcomes. Encouraging employees to see top-performing surgeons may also lead to reduced costs, and less time lost to complications or lengthy recoveries. And with the MPIRICA Quality Score, primary care physicians can refer patients with confidence, knowing they have an evidence-based way to assess the referred surgeon’s outcomes. What is the difference between the MPIRICA Quality Score for hospitals and that for individual physicians? 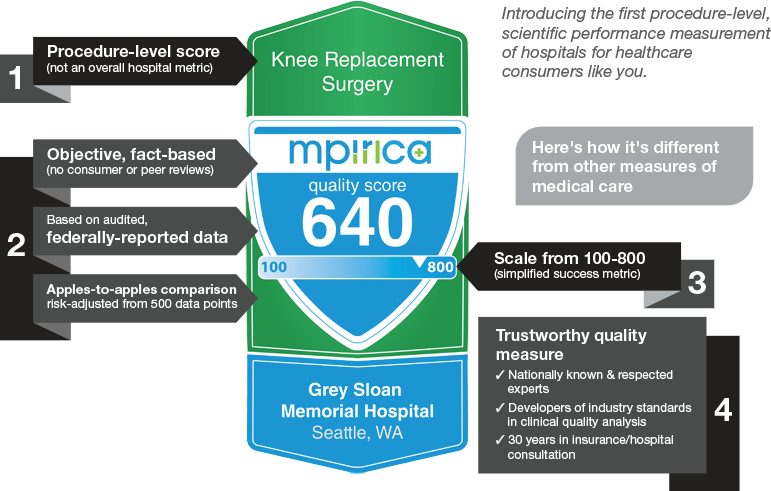 The MPIRICA Quality Score uses the same data and methodology to rate both surgeons and hospitals. But surgeon scores focus on results from the individual surgeon, whereas hospital scores combine the results of every surgeon who operates there. This means that hospitals are only as good as the surgeons they host – and the only way to achieve a high MPIRICA Quality Score is to produce superior surgical outcomes. What number range is considered to be a "good" score? How about "bad" or "average" scores? A score of around 600 represents average care at good performing facilities. Scores of 700 and above represent superior care. Scores of less than 400 represents substandard care. Small differences between scores may not be meaningful, but a greater difference between scores represents an increased degree of certainty that there’s a material difference in the quality of care being delivered. A high score doesn’t guarantee a favorable outcome and a low score doesn’t guarantee a poor outcome. However, lower scores indicate, based on historical performance, there is greater risk of having an unfavorable outcome resulting from the care delivered. Can MPIRICA guarantee a safe outcome for a doctor with an 800 score? Every surgery comes with risks. Every procedure has a chance of failure. The unfortunate reality: no doctor, no facility, no company can guarantee a healthcare result. And no credible professional would ever try. Just like with the stock market or a baseball player’s batting average, past performance does not predict the future. But, with strong data and with smart analysis, MPIRICA can offer a reasonable evaluation of past performance to help make assessments. The MPIRICA Quality Score succinctly captures a hospital’s – or a surgeon’s – track record of success. So although MPIRICA can’t guarantee it, a surgeon with an 800 score has excellent odds of producing a desirable outcome. MPIRICA does not offer advice, only interpretations of past performance through the Quality Scores. Patients and caregivers should always seek advice from medical professionals when making healthcare decisions. Why should I rely on the MPIRICA Quality Score? Why not patient review websites, or hospital websites themselves? Frequently, sites that rank hospitals and surgeons rely on patient reviews. But, these subjective submissions are not a reliable guide to quality. Patients can be biased by factors that have no relationship to outcomes – for instance, a hospital’s parking situation alone can swing reviews on Google. Patient ratings also have serious weaknesses. For one, patients who leave online reviews tend to have extreme positions. Patients who had a middling experience often don’t bother to speak up. Most reviews are either one- or five-star, and that gives an incomplete picture of a provider’s quality. And quality data published on hospital websites has a major flaw: bias. Hospital websites are, first and foremost, marketing operations. Their priority is to attract new patients. These websites are almost never outright deceitful – but they have strong incentives to highlight their facility’s strengths, and downplay their weaknesses. That’s why The MPIRICA Quality Score relies on clinical outcomes data to measure performance. It’s the best way to help patients (as well as payers) make clear-headed assessments about care. Does MPIRICA use reliable data to calculate scores? MPIRICA currently uses data from the Center for Medicare and Medicaid Services (CMS) to inform the Quality Score. The primary dataset is called MedPAR (Medicare Provider and Analysis Review), which contains hospital final action stay records for all Medicare beneficiaries. There are 3 reasons behind this choice. 1 - CMS has the largest, broadest, most frequently used dataset available. The vast majority of hospitals in America participate in Medicare. That means CMS has more provider data than any other payer or agency in the country. It’s national in scope, accepting claims from hundreds of thousands of surgeons. Working at this scale, it takes CMS two years to process and release the data. So the most recent available outcomes results are currently at least 24 months old. But despite the lag-time, there’s simply no comparable database in the US. 2 - CMS has the most reliable database available in the country. Hospitals have strong financial incentives to give correct information to CMS. The data is standardized, making it easier to work with. It’s also audited regularly, and hospitals face stiff penalties if they misrepresent it – including prison sentences. The data is standardized and is more robust than most claims data available for analysis. It’s also available for virtually every hospital in the country, allowing for a national comparison of performance and making CMS data the best choice of data that is accessible. 3 - Surgeons who care well for Medicare patients tend to care well for all patients. MPIRICA’s data rates outcomes for Medicare patients over 65. This cohort of older Americans has more – and more complex – health problems than other groups in the country. Any surgeon that performs well with older, sicker patients will likely have good results with younger patients, too. Of course, more data across a wider patient population would strengthen the Quality Scores. MPIRICA invites all hospitals and insurance companies to provide their own clinical or claims data to fill in any gaps that may be left by using CMS data. How does MPIRICA make sure that its rankings are fair? No two patients are alike. Every hospital serves unique populations. Sicker, frailer patients will be at greater risk for mortality, readmissions, or complications – regardless of the surgeon’s skill. A truly fair scoring system won’t penalize surgeons for taking on risky patients. Nor will it artificially reward hospitals for working with an affluent, healthy population. To level the playing field, MPIRICA’s physician-researchers created predictive risk models. They use over 500 risk factors to assess patient populations. These factors include broad demographic information like the patient’s birthplace, age, and gender. But they also go deeper into lifestyle factors, past diagnoses, and previous interventions. MPIRICA uses these data points to compute predicted outcomes for each provider. Based on their patient mix, every hospital and every surgeon will have an expected number of mortalities, readmissions, and complications. The Quality Score then rates providers based on how they perform against these predictions. This rigorous risk-adjustment practice helps ensure that every hospital and every surgeon gets a fair rating. How is the MPIRICA Quality Score different from hospital ratings and quality information available on other websites? The MPIRICA Quality Score is based entirely on measures of actual medical outcomes supported by real data. This means the Score is grounded in data – not opinions. The MPIRICA Quality Score is risk-adjusted at the patient level using sophisticated predictive modeling techniques. This ensures that the MPIRICA Quality Score reflects the actual quality of care – rather than the complexity of individual patients. The Score incorporates measures like severe complications and mortality while patients are in the hospital, as well as readmission rates and mortality over a 90-day period after discharge. ER visits are taken into account for outpatient procedures. Hospital or physician performance on these three components are individually weighted, scaled, and aggregated to produce a single score between 100 and 800 (similar to a credit score) that consumers can use to compare different hospitals or surgeons that are being evaluated. Check our methodology page for additional information. Who are the people behind MPIRICA? Why are they the best team for this job? In 2014, MPIRICA’s founder and CEO Shakil Haroon had a sick family member living overseas, who needed advanced surgery. He wanted to find the best possible hospital for the procedure. An engineer by training, Shakil was most interested in the data backing up hospital claims of offering best-in-class care. But that proved much more challenging than he thought. After several frustrating weeks of research, Shakil realized – this shouldn’t be so hard. That’s how he got his vision for the MPIRICA Quality Score. Shakil wanted to give patients an easy, reliable way to find high-quality surgical care. So he assembled a founding team to empower patients and payers, using the best research available. He sought out and engaged a team of doctors and statisticians at MPA Healthcare Solutions, who had researched the same problem for nearly 30 years. This team has published dozens of peer-reviewed articles on ways to assess healthcare quality (request a selected list of articles by emailing quality@mpirica.com). Their work, stemming from decades of clinical data analysis with health systems and large insurance companies, formed the backbone of MPIRICA’s outcomes-based, apples-to-apples comparison of providers at the surgical procedure level.